Learn 3 promises that can revolutionize a parent’s ability to build powerful relationships with their kids, especially when you are not able to be physically present for the child with Caroline de Posada as she shares with host Mike Domitrz. Nurturing special relationships can be a daunting task when you travel, are divorced, or work long hours. Coming from divorced, professional parents and a father, Dr. Joachim de Posada, CSP, who traveled extensively as a global speaker and bestselling author, Caroline de Posada understands the struggle to maintain meaningful & special relationships in our personal and professional lives. With humor, charisma and authenticity, this engaging storyteller transforms the way busy professionals manage the demands of work and family to reduce stress and build success. Fluent in English and Spanish, Caroline is a seasoned professional speaker, writer, attorney, wife and mother to three little boys. Mike Domitrz: Welcome to the RESPECT Podcast. I’m your host, Mike Domitrz, from mikespeaks.com, where we help organizations of all sizes, education institutions, and the U.S. Military create a culture of respect, and respect is exactly what we discuss on this show. So let’s get started. Mike Domitrz: Alrighty. Welcome to this episode. 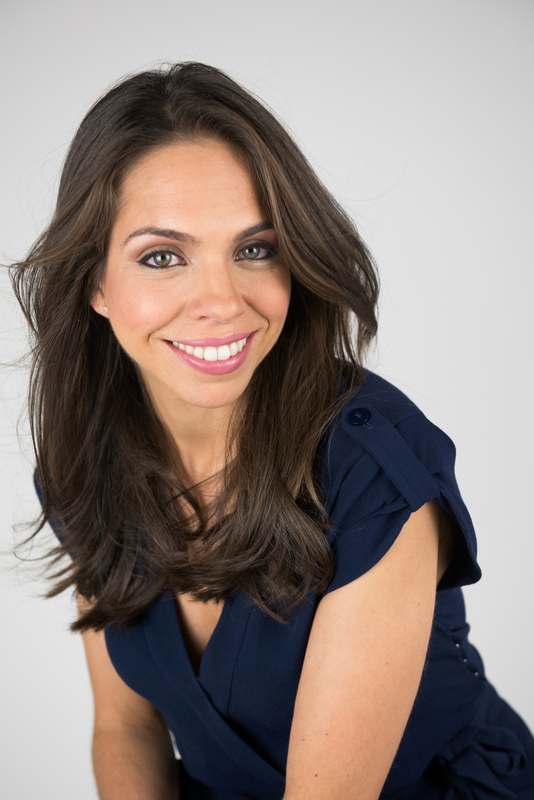 We have a special guest, Caroline de Posada, who is Founder of Be There Even When You’re Not. She is a seasoned professional, and she is a speaker, a writer, an attorney, wife, and mom to three boys. So, Caroline, thank you so much for joining us. Caroline: Thank you for having me. Mike Domitrz: Aah, our pleasure. We’re all about respect. Today we’re going to talk about respect and how it plays a role in being present and the work you do, so if you could tell everybody what Be There Even When You’re Not is about. Caroline: Be There Even When You’re Not is a movement encouraging professional parent and divorced parents with strategies to communicate and stay present in the lives of their children. Basically, I want them to be able to have the relationships they long for and that they deserve, but it’s difficult to do that when you’re traveling all the time, or you only see your children every other weekend or you live in a different state, but there are ways to do that. Mike Domitrz: So what inspired you to go down that path? Caroline: My father was a motivational speaker and a global best-selling author, a consultant, and he was on the road 80% of the time. In addition to that, my parents got divorced when I was just 2 years old. So my father and I didn’t really have a lot of face-to-face time together, yet we were very, very close. He always found a way to be present in my life. After I got married, one day I was with my husband. We were having a date night, and we have three little boys. So, for us a date night was we were sitting on the couch drinking a glass of wine and praying that they wouldn’t wake up upstairs. Caroline: We got to talking and we started talking about being a parent and my parents and his parents, and he said, “You know what I don’t understand? I don’t understand how you could be so close to your father. I mean, I love that you’re close to him, but he was never around. How did you create that relationship?” At that moment, I had a thought, and I said, “Okay, hold on,” and I went upstairs to my office and I pulled out this box that I had carried with me to every home that I’d ever had. When I brought it downstairs and I gave it to him, he says, “What is this?” I said, “Open it.” So he opened it, and it was a box of postcards, letters, newspaper clippings, birthday cards, all sorts of cards that my father had been sending me throughout my entire life. Caroline: So we started reading those cards aloud, and we were laughing. We were crying, and my husband looked at me and he said, “You know, I finally get it. Your father may not have been there, but he was there every step of the way,” and in that moment, he said, “Caroline, you have to teach divorced dads how to be there even when you’re not,” and I just loved that phrase, and that was when it was born. Mike Domitrz: Very cool because as soon as you started thinking of it, I thought myself as a speaker, well, speakers would fit into this. Married speakers would fit into this. You don’t need to be divorced to … Traveling salespeople could fit into this. Mike Domitrz: Anybody who spends a lot of time away from home for their career, whatever reason, has to figure that out, like “How do I balance, how do I integrate the father, the mother side of life into this professional side of life so that I am present for my kids even when I’m not there?” And that is the key language there, when I’m not physically present. Mike Domitrz: Because there are parents who are physically present who aren’t there. Caroline: So from that Be There Even When You’re Not, was born Be There When You Are There, and that’s part of the promises is knowing how to be there when you’re not there, but also knowing how to be there when you are there. Mike Domitrz: So the core principles for both of those, I would imagine, are the same, the core values. So what are the core values here of being present or being there for our kids? Caroline: I’ve uncovered three promises, and I like to call them promises because that’s in essence what I think we do in relationships. We make promises, and part of the problem that we have is sometimes we don’t know how to keep those promises. Caroline: So the promises that my father made and kept were the first one was that he communicated with me in one form or another every single day, which I know can be challenging for different people. But wherever he was anywhere in the world he called me every day, and he sent me postcards from everywhere he was in the world, and then eventually that turned into emails. So I had a form of communications with my dad every day up until he died. Caroline: The second promise that he made was show up when you can which goes to be there even when you’re not. Now, my father wasn’t able to be at every event or see me every day or tuck me in bed every night, but what he did do was any opportunity that he had to show up to one of my events or something that was important to me or just to see me, he took advantage of that opportunity. We had to develop systems in order to do that. I mean, he put me in his calendar as a requirement. I would fit into his calendar, and he’d tell me, “Okay, what day do you need me to be there?” and if he got a speaking engagement on the day that conflicted with me, I came first. Caroline: What he ended up doing was when there were conflicts that I couldn’t come first because the other conflicts came first, he did what I like to call “expected surprises,” which is he’d fly into town on a Tuesday and he would take a cab and show up at my school and take me for ice cream or just to have a chocolate chip cookie, or he’d take the red eye so that he’d make it to the party that he told me he couldn’t make it to. So he was always showing up in one way or the other. Mike Domitrz: Let’s pause on that because I think that’s incredibly powerful, obviously very connecting, meaningful for your relationship. I can hear some people thinking right now though in their minds, wait a second. I don’t have the financial ability to do the kind of things you’re describing, to fly in last second. Your father was very successful. [inaudible 00:06:14] amazing impact on stage for millions of people’s lives. So for somebody sitting here going, “What if I don’t have the ability to fly in and surprise, to be able to do that?” Maybe the next two promises do that, I don’t know, and so maybe I’m jumping the gun here. Caroline: No, actually my father is very successful but he wasn’t always. There were plenty of times that he was struggling in the beginning. As you know, being a speaker is quite a journey, and it’s not always profitable. So there were times that my father wasn’t in a financial position to be taking elaborate trips or anything like that. When I talk about flying in, in his particular case, he happened to live in the same state as I did. He lived in the same city as I did. So he was flying in home and that’s why … Traveling is part of his career, and that’s why he’d be able to fly in. Mike Domitrz: There’s so much value in that. So that we’re talking divorce, but those who are married, your kids need to see that you are each other’s priorities, and they are here because of that. Caroline: Yeah, and I often laugh because, especially for speakers, when you’re married to a speaker, like can be very tough because you’re the one at home. You’re the heavy lifter and you’re the one that’s dealing with the burden of day to day, and sometimes showing up when you can, in my opinion, is showing up to town and on the day that you’re in town, buying your spouse a massage or a day off or taking that person on a date. I mean, there so many ways to show up. Caroline: I often talk about The Five Love Languages because The Five Love Languages is an incredibly insightful book teaching you how to speak your spouse’s language, and we were talking just about spouses. I mean, I tell my husband, “If you want to tell me you love me, make the bed in the morning.” That tells me you love me. When he makes the bed in the morning, he’s showing up. So it’s showing up in the ways that you can, in the language that your spouse understands, in the language that your children understands, and it’s just, it’s putting your part. But, again, we always go back to the basic, which is you’re communicating that priority. The person that you’re communicating to has no doubt in their mind that you would do anything or everything for that person. Mike Domitrz: I remember once when I caught myself saying to my kids … this is years ago, “Give me a few minutes.” And then a few minutes would be 30 minutes. I caught it because of a speaker I heard, I caught it and said to my kids, “If I’m not there when I say, ‘In a minute’ you get this.” It was something they would want, right? Mike Domitrz: … so I’m going to be there in one minute.” What it does, it’s forcing you but it tells your kids how serious you are. Caroline: Yes, and that takes me to my third promise, make them a partner in your journey. A lot of times we tend to make our spouses our partners in our journeys, and sometimes we fail at that too. But with our children, I always say how often do we communicate to our children what we do for a living, who’s lives we impact, what is the purpose of what our work is, why are we in the careers we’re in, what are our financial struggles, what are we anxious about, what keeps us up at night. Now sometimes we want to shield our kids from our problems, but often times I find that the more honest and open you are, and the more you communicate and make your child a partner in your journey, the more they understand why you say, “Give me a minute.” They understand, they get it. You know we’re all living this life and going through this journey, and they’re part of it. My father used to tell me that by me staying at home and just doing my homework, and sacrificing my time with him, and letting him go out and speak to the world, I was indirectly impacting the lives that he touched because he would not be able to do what he did well if he didn’t have my support. Mike Domitrz: If my partner, my wife, or my kids, or something causing [inaudible 00:12:13] I can’t be doing this, then I wouldn’t be doing this because that’s a priority, it’s family. Mike Domitrz: Not everybody feels that way, not everybody feels that way, so it’s different. Caroline: There was one time where … and my father was traveling all over the world, and there was one time when they offered him a position in I think it was Michigan to be the vice president of Cargill. I don’t know if you know that company, it is a huge company. He was already the vice president of Cargill Latin America, but they had offered him that position which had now moved to headquarters, which I believe is in Michigan, or Minnesota. That was where I drew my line, I said, “I can’t have you living in another state. I can’t do it because I don’t see you as it is, and if you move to another state I’m never going to see you.” And he declined that position, he did. That was the one time that he said, “It’s too … I cannot do this, I have to give this opportunity up.” And he did. Mike Domitrz: That’s powerful, he stood by his promises. I love that because that’s about painting the vision, which we talked about. Sharing the journey, and that’s critical for everyone in your life to be able to share that vision, and that journey. Where do you think are the biggest struggles people have in living those promises? Caroline: Day to day, everyday can become a struggle because you get busy, because the one struggle that I find with divorce parents, the biggest struggle that I find is when the other parent doesn’t cooperate, when the other parent doesn’t allow you to talk to the child, or sabotages you to the child, or interferes in the relationship, that is a real struggle. There’s even a legal term for it, which is parental alienation, and it goes from minor to really extreme cases. That is a real struggle, but other than that there is the day to day because it’s hard everyday to be communicating “I love you” when you’re busy, and you’re worried, and you have to be on a plane, and the kid is going to sleep at 7:00 but you don’t land until 8:00. It comes with challenges, it really does. Mike Domitrz: Yeah, or it doesn’t land, right? That time. It lands, obviously we’re not here at all, but it doesn’t land for five hours and that game you were flying in to see happens without you there. These are all possibilities. Caroline: These are real possibilities. Mike Domitrz: Because that’s a promise you can fulfill versus, “I will never miss.” You could be in the hospital, I mean anything could happen that could cause you to miss. Caroline: When I used that time that I was supposed to call my dad, and I called him and I said, “Dad, this girl is in trouble. She’s having a panic attack, she can’t go on the competition. She’s hyperventilating.” And he said, “Put her on the phone.” And my father spent an hour on the phone with her, calming her down, and giving her the tools … ‘Cause he was a sports psychologist so that she could compete that day. We won first place in that tournament, and I always think to myself, “One could argue that he was there.” Right? Caroline: He may not have been physically there. Mike Domitrz: … emotionally supportive. Right. And what’s the most outrageous thing your dad did as an example of being there? Caroline: And he said, “Well, just because I can’t come into your house doesn’t mean I can’t see your closet.” So through the window I opened my closet, and like Vanna White I showed him all how organized my dolls, and my toys, and all my shoes, and clothes were and in 30 seconds he was gone but I knew that he was always going to be there for me no matter what. Mike Domitrz: So curious … I see people wondering, how long before your mom found about that story? Caroline: I think it was years. Mike Domitrz: I’m just going say … yeah. Caroline: I don’t think she found out for years, but let me tell you, my mom ended up having a very good friendship with my father because she realized how committed he was to being my father. She was wonderful in allowing me to have that relationship. Mike Domitrz: Caroline, we’ve been talking about your dad, but you haven’t said his name. I know him because I got to see him speak, and his books are powerful. Mike Domitrz: Yeah, so do you want anybody to know ’cause they might want to look up his books, they might want to … because while he’s no longer with us, certainly they can get his brilliance still? Caroline: Absolutely, his name is Joachim De Posada, and he is most known for his book Don’t Eat The Marshmallow Yet, and he has a series which includes Don’t Gobble The Marshmallow Ever, and Keep Your Eye on the Marshmallow. Mike Domitrz: What was the most difficult thing you had to do to respect your dad? Caroline: … at the end of his life. He had been fighting for a long time. He did everything he could and at the end of his life, when he was done, he was tired. I had to respect that he wasn’t going to fight anymore and that his time here was done. Mike Domitrz: Yeah, that has to be tough to know that that’s a goodbye, in a way, yes. Caroline: It was a goodbye, and one of the things that I remember feeling at that time was he’s done so much for me that it’s my turn to let him go. Mike Domitrz: Right. That’s powerful. And you said, throughout his life, he had made some questionable decisions, and all parents do on some level. Some are more, maybe, drastic than others comparatively. I mean, we’re not talking abusive kind of decisions. Those are different. Mike Domitrz: That’s a different ballgame. Mike Domitrz: But, mistakes we make as parents. Mistake we make as partners. Mike Domitrz: And you said, hey, my dad made plenty and I had to respect those. Do you mean you had to respect that that’s his call, not yours? Separate from my respect the choice you made. Caroline: And I did. And we made that promise to each other. Over the years, I happen to have known that that was something that that was his life. That he sometimes had more than one girlfriend. It wasn’t always the case, but it happened. When that happened, I knew everything about him and as I grew older, I always knew everything about him, even if it wasn’t the best. Even if it was a mistake, or a flaw, or an imperfection that he had, but I loved him anyway. Mike Domitrz: So, this brings in a really important discussion, which is what we’re starting to go down there. There’s a difference in me respecting you as a human being and respecting your choices. Caroline: Well, my mother taught me to love my father unconditionally. That time, when that happened, that I found that out, obviously, I realized immediately that my parent’s divorce probably had something to do with that. Caroline: So, I got home and I was ready to take my mother’s side. So, I went up to my mom, and I’ll never forget it, she was at the stove and she was cooking and I said to her, “Mom. I want to know why you and dad got divorced.” My mother had never told me anything bad about my father. And she said, “Well, why are you asking?” I said, “Well, because I found out today that dad was a two-timer and I want to know, is that the reason you got divorced? Did he cheat on you?” And my mother looked at me and said, “Caroline, let me ask you a question. Is he your husband or your father?” And I said, “He’s my father.” She said, “Is he a good father?” “Yeah.” “It’s not your business to love him as a husband. Your business is to love him as a father. So, love him for how he is with you.” And that was it. Mike Domitrz: That’s very powerful. Very, very powerful. Caroline: Yeah, so I learned to love him the way that he was. No, he wasn’t perfect, but you know what? He was absolutely wonderful and a good, wonderful man and over the years, because I knew him as who he was, over the years, he actually became more heroic in my eyes. Because it’s not like I had him on a pedestal and then he fell. I knew he was just human and normal and imperfect and as I got older and I realized how wonderful he had been and how much good he’d done, he became a hero to me. Mike Domitrz: Well, I appreciate you sharing that. That right there shows the level of respect, and openness, that you were taught from both your parents. Mike Domitrz: Right? They both were about being present for the relationship I’m in now, right? Your mom saying, that’s your father/daughter relationship. I have the mother. I have the wife/husband. You have the daughter/father. Respect that relationship. Caroline: That’s right. And talking about the choices, and about respect, your children are going to make choices that you adamantly disagree with. Caroline: And one of the beautiful things about my relationship with my father, was that we didn’t have that judgment against each other. It’s not like I had this idea that my father was this perfect person and therefore any mistake I made was utterly failing him. It was more like we’re just human. Now, I didn’t do a lot of things that upset my father when I was growing up. I was actually a really good kid, however, I didn’t feel like I would be judged by him if I did make a mistake. Mike Domitrz: Yeah. That’s powerful. What are you working on today? Caroline: I am working on a book, which I’m very excited about. It’s actually a different spin. It’s a new story that I’m writing about and it’s called The Cliff Story. And it’s basically a situation that I had. This past New Year’s Eve, I was with my husband and my three children, and we were traveling in North Carolina and we were driving up a mountain and our car almost fell off the mountain. There was black ice and we lost control of the vehicle and we started skidding and we just missed the edge by just a little tiny bit, but thankfully, we did not fall off, but we ended up having to abandon our vehicle and climb up about three and a half miles to get to safety. It was a huge experience for us and has been a transformational experience. And I’m writing a book about that. Mike Domitrz: That’s powerful. And your own dad’s book is one that you recommend. We always ask, any guest that I have on the show, what’s a book they recommend, and you told me before and you really recommend Keep Your Eye on the Marshmallow, by your dad. What is the big reason for people to want to grab that book? Caroline: Don’t Eat The Marshmallow teaches you about delayed gratification, which was my dad’s first book. That was a book that’s been very powerful because it teaches you the concept of delayed gratification, but it’s a fable. It’s a story, and that story progresses as you move on to the second book and then the third book. What I like about the third book, is that it incorporates family. It incorporates relationships. It actually ties in how delayed gratification will help you in these areas of your life to be able to enjoy the things that really matter. To put first things first. That’s the reason that I like it, because it’s kind of like a culmination of, well, first you learn the concepts of delayed gratification, which you know, saving money and the practical aspects of it, because you’re always climbing, trying to be successful. But when you get older, you realize the things that really matter and I think it’s very important that we read about that, especially when we’re young, so that we don’t take it for granted. Mike Domitrz: Well, I love it and you’ve been a fantastic guest. For anyone listening, you’re going to find the links to Caroline’s websites, both carolinedeposada and thepostcardpromise.com, and the book, all of it, in our show notes, so they can get a hold of you. They can link right to you. Thank you so much, Caroline, for joining us. Caroline: Well, thank you for having me. Mike Domitrz: Thank you for joining us for this episode of The Respect Podcast, which was sponsored by The Date Safe Project, at datesafeproject.org. And remember, you can always find me at mikespeaks.com.